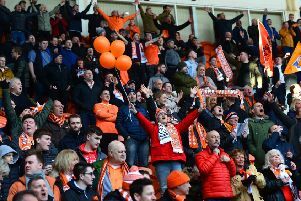 Terry McPhillips believes there is no reason why his Blackpool side can’t spring a surprise and end table-topping Luton Town’s 27-game unbeaten run. Pool must visit Kenilworth Road, where Mick Harford’s side haven’t lost all season and have won 15 of their 20 league games. But Blackpool have impressed away from home and won 1-0 at Portsmouth when they led the league in January. They have avoided defeat at Sunderland, Charlton Athletic, Peterborough United and Coventry City, and are still to visit Barnsley. McPhillips said: “I don’t see why we can’t ruin their unbeaten run. I think we’ll play better than we did against Plymouth. We seem to be doing a bit better away from home. Pool need an impressive run of their own to sneak into the play-offs – they are six points outside with six to play. Pool have won only once at Bloomfield Road since early December, drawing their last three at home.